Home/King's Cars, Tree Plantings/Ross Creek, Victoria. 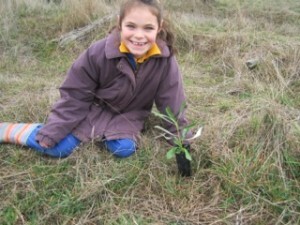 On National Tree Day (Friday July 26th), Jenny Walsh from Ross Creek Landcare and students from Woady Yaloak Primary School planted out 300 trees at the local reserve next to the school. They even made a special cake for the occasion. A tree to celebrate National Tree Day. Peter King from King’s Cars Ballarat, has been long time supporters of Fifteen Trees. For every new Mitsubishi and Citroen car sold, Peter has 15 trees planted. All up, Peter has now helped fund the planting of over 2500 trees. 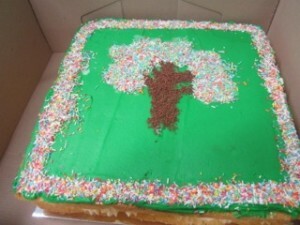 His trees can be found at Kinglake Primary School, Golden Beach, Metcalfe, and Castlemaine to name a few sites. Thank you to Peter and the team at King’s Cars for your ongoing support of our native environment. By Colleen Filippa|2017-12-15T10:43:10+10:00October 2nd, 2013|King's Cars, Tree Plantings|Comments Off on Ross Creek, Victoria.